K.F. Raizor, author of the website Raizor's Edge and the book We Can't Sing and We Ain't Funny: The World of Homer and Jethro is our guest writer today on That Nashville Sound. She's ever so gracious to provide wonderful tributes to honor those to whom the music we treasure just wouldn't be the same without. Thank you, K.F. Back in the late 2000s I saw Jim Ed Brown at the Midnite Jamboree. At the autograph/meet & greet after the show I told Jim Ed how much I wished the Browns would get inducted into the Country Music Hall of Fame. Brown smiled shyly, then said, "Well, if they're gonna do it, I wish they'd do it soon, because Maxine's health isn't good." 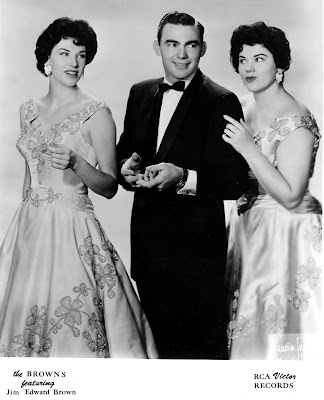 Who would know that Maxine Brown, the eldest of the singing trio that finally got that Hall of Fame induction in 2015, would outlive her two performing siblings. Today comes the sad word that Maxine Brown has joined her famous brother and sister in death. Maxine passed away earlier this week (1/21) in a Little Rock hospice with her family at her side. She had been suffering from heart and kidney issues. After Bonnie graduated from high school she joined her older siblings and "The Browns" became the legendary trio that we remember. While there were many pit stops along the way in the 1950s (most notably, Jim Ed's Army service), the trio built a career with songs such as "I Heard the Bluebirds Sing" and the Ira and Charlie Louvin composition "I Take the Chance." With the advent of rock and roll in the mid 50s the Browns' career waned significantly, along with many other country stars. They were about to call it a career when they recorded "The Three Bells." From there, the floundering career soared to new heights, with the song topping country, easy listening, and "hot 100" charts. In the mid-60s the family career ended, with Maxine singing lead on their final single release, "Big Daddy." Bonnie and Maxine left to be with their young families, while Jim Ed continued with a successful solo and duet (Helen Cornelius) career. The Browns would reunite on occasion at the Grand Ole Opry, including one memorable weekend in 2009, when the 50th anniversary of the release of "The Three Bells" was celebrated. In 2005 Maxine penned a bestselling autobiography, Looking Back to See, about her career in country music, focusing on the trials of performing in the 50s. The book won the Ella Dickey Literary Award. Shortly after the 2015 announcement that the Browns were being inducted into the Country Music Hall of Fame Jim Ed died of lung cancer. At the medallion ceremony later that year Bonnie announced that she, too, had lung cancer (although she never smoked). She passed away two weeks before her birthday in 2016. And so closes the book on another legendary country music act. The three bells -- Jim Ed, Maxine, and Bonnie -- ring no more on earth. Oh, what a legacy they left us.